My very own website!!! Yikes! Happy Monday everyone and welcome to Global Blogging! Wherever you are in the world, come and join me and Heather at Shank You Very Much! You can link up any 2 posts then please comment on both host posts and the one in front of yours. Please encourage your friends to join us by sharing on social media (or send them a DM and insist)! Linkies are a great way to discover new blogs and blogging friends as well as promote your own posts and raise your DA so please visit us each week! So why should you use this linky? We have fascinating bloggers join us every week, Heather has an amazing sense of humour and every week we pick our favourite post so link up now to get the chance to earn our featured blogger badge and a precious backlink. Bloggers from all around the world are invited to link up their posts: come and join us! If you need any help linking up, tweet one of us (@HeatherKeet, @musingstiredmum), we are happy to help! Please add #globalblogging to any comment so we know you came from here! You may link up to 2 posts between 6am on Monday and 11pm on Tuesday (GMT!). All subjects welcome! Want an extra like on Insta? 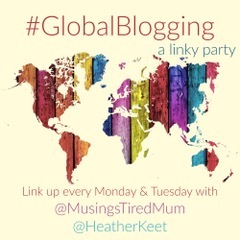 Use the hashtag #globalblogging and check out the others as well! I look forward to reading your posts and getting social! Have a great week everyone! Disclaimer: all items are bought personally unless otherwise stated. Posts that have been commissioned will be labelled as sponsored or collaborative based on the brand’s preference. I am a member of Amazon Affiliates: if you choose to buy a product using the link I provide I will get a small commission at no cost to you.